We are constantly being told by politicians and the press that the welfare system is broken. Actually cash benefits (and to a lesser extent spending on services) are the only part of the welfare state now reducing poverty and inequality in Britain. 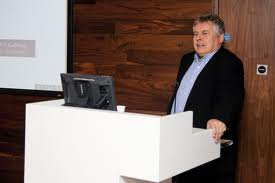 The tax system is the element of the welfare state that is broken – if anything is. It is time that this was recognised. 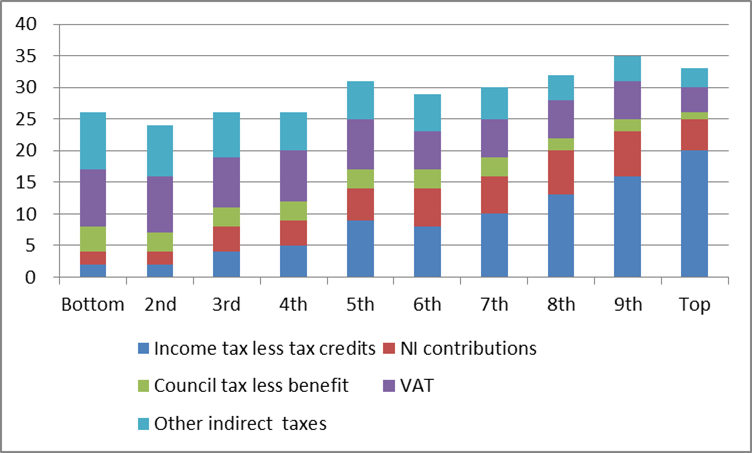 Figure 1: Tax paid as a proportion of gross income – all households 2011/12. Figure 2 gives the same results for households with children and Figure 3 for retired households. 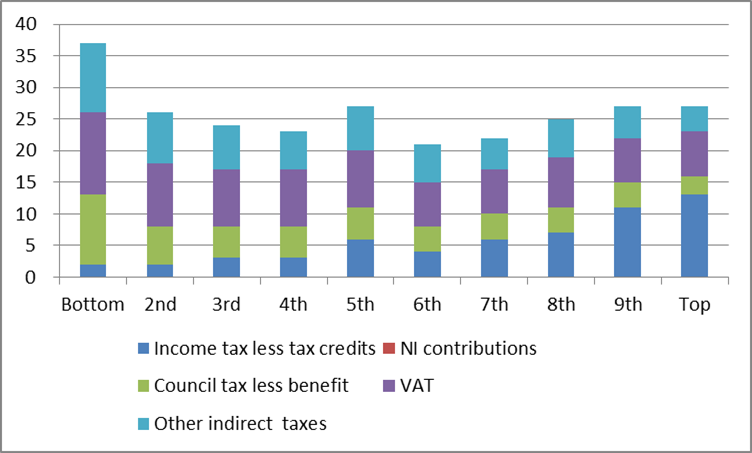 Figure 2: Tax paid as a proportion of gross income – households with children 2011/12. This situation has been getting worse over time. Figure 4 shows the percentage point difference in the proportion of tax paid by the top decile compared with the bottom decile in each election year since 1979. 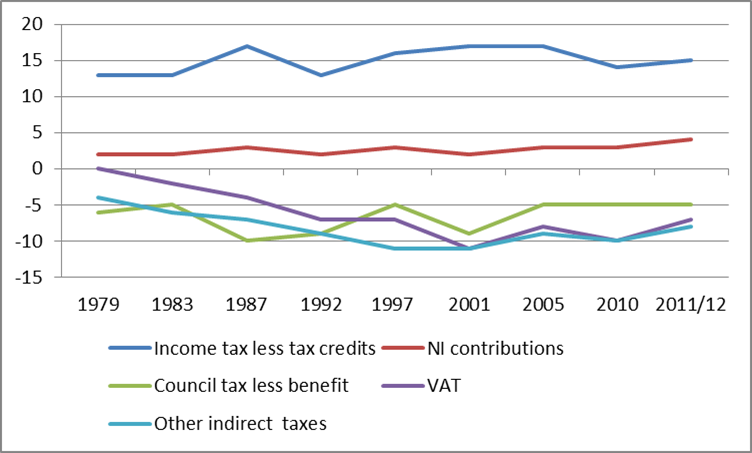 Thus in 1979 the top decile paid 13 percentage points more in income tax and 2 percentage points more in NI contributions by 2011/12 these differences had increased to 15 and 4 percentage points. Direct taxes became slightly more progressive over the whole period. Meanwhile the indirect taxes became more regressive. In 1979 the bottom decile paid the same proportion of gross income in VAT as the top decile but by 2011/12 they were paying 7 percentage points more. Other direct taxes also became more regressive. 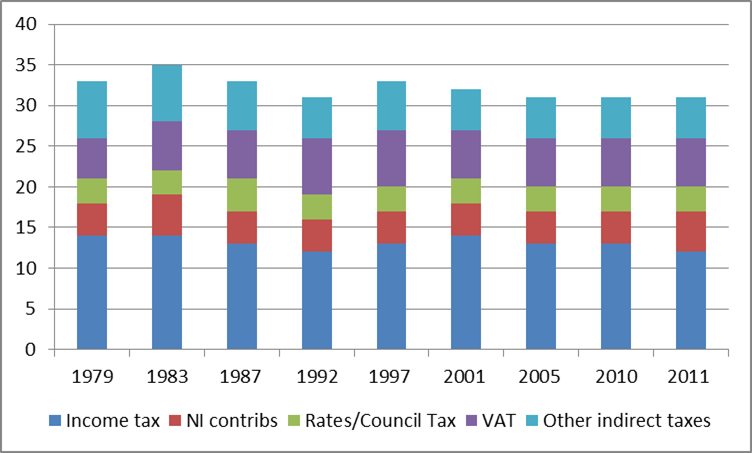 Council tax remained regressive over the whole period – not becoming more regressive thanks partly to Council Tax benefit. 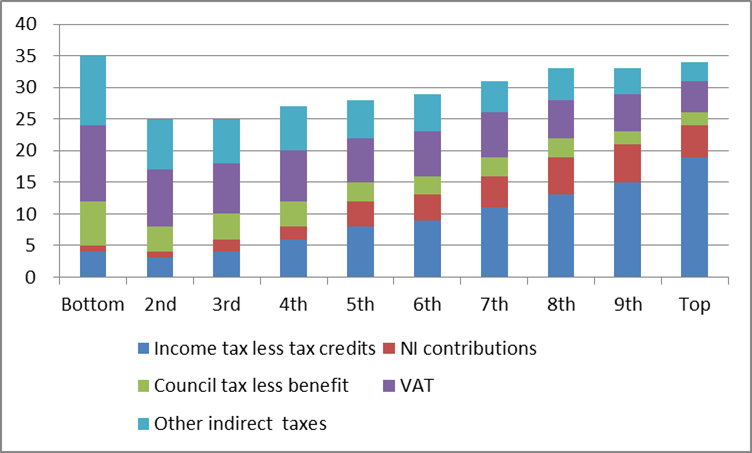 We can expect to see it become more regressive now the Council Tax Benefit has been abolished. Figure 4: Percentage point difference in proportion of gross income tax paid by the top decile compared with the bottom decile. Figure 5 shows that the proportion of gross income taken by all taxes has fluctuated over the period but the proportion of the total taken in income tax has fallen and the proportion taken in regressive taxes has risen. 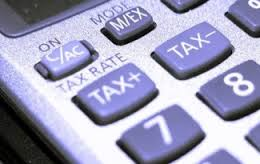 The Chancellor raised the income tax threshold in the last 2013 budget – a measure which will not help the lowest income households who don’t pay income tax. This situation can be summarised by observing the impact of taxes and benefits on original (market) income inequalities (as measured by the gini coefficient – 0 = maximum equality, 100 equals maximum inequality). Figure 6 shows that cash benefits achieve a big reduction in gini coefficients – the difference between original income (blue line) and gross income (red line). Direct taxes achieve a little more reduction – the green line. Then indirect taxesincrease the gini coefficient – roughly to the level of gross income ginis. Direct and indirect taxes cancel each other out.